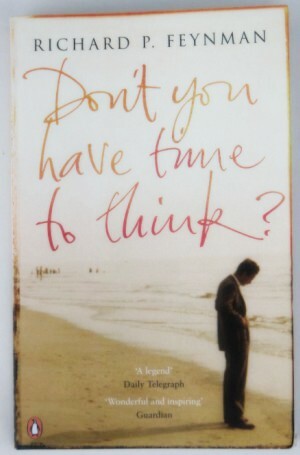 I’ve been reading Don’t You Have Time to Think?, a collection of letters written by (and to) the great physicist Richard Feynman. As I tweeted earlier today, Feynman comes across as warm, generous, sincere and self-effacing. He was also blessed with wit, patience, and admirable directness. I regret having to do this, but I’m returning this paper to you unread. My schedule is such lately that I must refuse to get bogged down reading someone else’s theory; it may turn out to be wonderful and there I’d be with something else to think about. Don’t tell me – I might think about it! I may adopt that. On a linguistic note, the book includes correspondence with A. M. Hughes at the OED, who was seeking further information on the origins of parton, a word coined by Feynman to refer to what we now call quarks and gluons. The provisional definition of parton to be included in the OED Supplement was: “Each of the hypothetical point-like constituents of the nucleon that were invoked by R. P. Feynman to explain the way the nucleon inelastically scatters electrons of very high energy.” Feynman found the definition “admirable”. Over on Tumblr, I posted one other letter from the book, wherein Feynman gives his reasons for declining an honorary degree after winning the Nobel Prize in Physics. If you’re interested in buying Don’t You Have Time to Think?, you can do so at Penguin Books – so long as typos don’t bother you inordinately: the edition I have, pictured above, contains several. Steven Poole has a short, accurate review in the Guardian that might sway you. 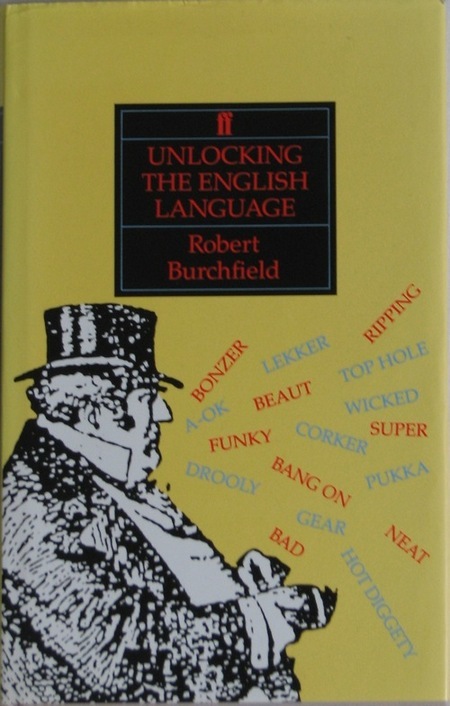 Earlier this year there was a minor media flurry about the English language supposedly attaining its millionth word. This (non-)event, which was dragged out for a few years, was such raiméis that I decided not to write about it at all, apart from a curt dismissal on Twitter. However, it did serve some useful purposes. For one thing, it prompted many interested parties – amateurs and academics alike – to write thoughtful criticisms. It got people writing, talking, and thinking about language. It also showed the extent of credulity or cynicism, or both, in many commercial news organisations. Shocking, I know. I could get carried away posting hyperlinks to worthwhile criticisms of the project (or ‘publicity stunt’, if you prefer), but out of mercy for my readers I’ll limit the links to a handful, each of which I heartily recommend: Ben Zimmer, Jesse Sheidlower, Grant Barrett, Michael Covarrubias, and David Crystal, whose post attracted a response from the man behind the millionth-word shenanigans. Language Log, an outstanding linguistics blog, covered the pseudo-event in considerable detail. To one of those posts, written by Zimmer, I added a comment with an excerpt from James A. H. Murray’s introduction to the first volume of the original Oxford English Dictionary. The main purpose of this post is to repeat that excerpt here on Sentence first. Before that, though, a few words about Murray (pictured, in his Scriptorium). It is possible that no one else could have done the job he did; it is almost certain that no one could have done it so well and with such commitment to quality over haste. He embodied a rare combination of knowledge, ability, temperament and dedication that made him ideal for the job, though over its many years he had more than occasional cause to doubt his suitability for it and the probability of its eventual completion. Here is Murray’s own diagram of the structure of the English vocabulary, followed by his exceptionally lucid explanation of it. The centre is occupied by the ‘common’ words, in which literary and colloquial usage meet. ‘Scientific’ and ‘foreign’ words enter the common language mainly through literature; ‘slang’ words ascend through colloquial use; the ‘technical’ terms of crafts and processes, and the ‘dialect’ words, blend with the common language both in speech and literature. Slang also touches on one side of the technical terminology of trades and occupations, as in ‘nautical slang’, ‘Public School slang’, ‘the slang of the Stock Exchange’, and on another passes into true dialect. Dialects similarly pass into foreign languages. Scientific terminology passes on one side into purely foreign words, on another it blends with the technical vocabulary of art and manufactures. It is not possible to fix the point at which the ‘English Language’ stops, along any of these diverging lines. The Vocabulary of a widely-diffused and highly-cultivated living language is not a fixed quantity circumscribed by definite limits. That vast aggregate of words and phrases which constitutes the Vocabulary of English-speaking men presents, to the mind that endeavours to grasp it as a definite whole, the aspect of one of those nebulous masses familiar to the astronomer, in which a clear and unmistakable nucleus shades off on all sides, through zones of decreasing brightness, to a dim marginal film that seems to end nowhere, but to lose itself imperceptibly in the surrounding darkness. In its constitution it may be compared to one of those natural groups of the zoologist or botanist, wherein typical species forming the characteristic nucleus of the order, are linked on every side to other species, in which the typical character is less and less distinctly apparent, till it fades away in an outer fringe of aberrant forms, which merge imperceptibly in various surrounding orders, and whose own position is ambiguous and uncertain. For the convenience of classification, the naturalist may draw the line, which bounds a class or order, outside or inside of a particular form; but Nature has drawn it nowhere. 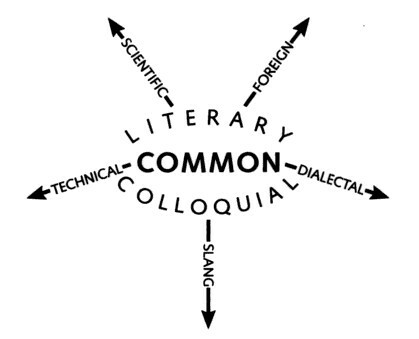 So the English Vocabulary contains a nucleus or central mass of many thousand words whose ‘Anglicity’ is unquestioned; some of them only literary, some of them only colloquial, the great majority at once literary and colloquial,- they are the Common Words of the language. But they are linked on every side with other words which are less and less entitled to this appellation, and which pertain ever more and more distinctly to the domain of local dialect, of the slang and cant of ‘sets’ and classes, of the peculiar technicalities of trades and processes, of the scientific terminology common to all civilized nations, of the actual languages of other lands and peoples. And there is absolutely no defining line in any direction: the circle of the English language has a well-defined centre but no discernible circumference. Sentence first has changed a bit over the last few months. Its focus remains the English language – grammar, usage, history, and so on – but it has taken recent detours into posts about birds, censorship, jazz, and spiders, among other things. Despite this or because of it, the blog has gained a few regular readers; this in turn has encouraged me to write more frequently. This week it was quiet here because I was very busy with work (editing and voluntary) and assorted activities (online and offline: one of my more absurd online projects concerns my bookmarks, of which I have tagged thousands, and which for mystifying reasons I decided to organise, slightly). A few weeks ago I had a long informal chat with Fate, lost a bet, and ended up opening a Twitter account. There is a permanent link to it in the sidebar to the right. Rather than explain myself, which might imply that my decision needs justifying, I refer sceptical readers to BLDGBLOG‘s common-sense defence. As a fan of concision I like the restraint imposed by Twitter’s 140-character limit. It makes a nice contrast with my blog posts, some of which are on the hefty side. So far I’ve had a lot of fun interacting with other Twitterers and posting poetry, quotes, information, nature reports, links, and occasional idle chatter about food, books, and Irish weather. Curiously, I seem to be the first person online to use the phrase “less than the yum of its parts” – at least somewhere googlable. Future biographers, take note. 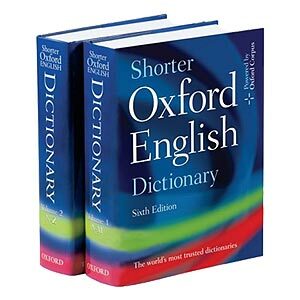 On a more scholarly note, I finally obtained a Shorter Oxford English Dictionary (pictured), which I ordered from The Book Depository. No longer must I rely on pocket, concise, and online editions. The Shorter OED is a beautiful book and a magnificent work, though its size makes it unsuitable for picnics (unlike, say, Merriam-Webster’s Pocket Guide to English Usage). Continuing the self-involved tone of this post, I was looking up “stamina” in the OED, for a post about “data”, and I came across an entry for the word “Stancarist”. Since my name is Stan Carey, I blinked and looked again: there it remained. It seems Stancarism derives from an idea championed by a 16C Italian theologian called Francesco Stancari (or Stancaro) (no relation (I think)). 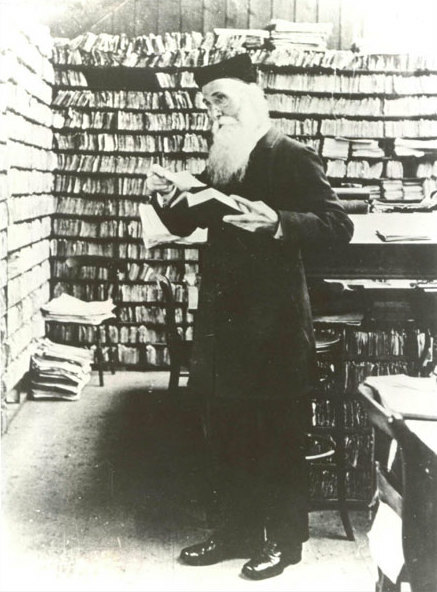 Bless the OED and bless its first editor, the remarkable James Murray. Since this post is less formal than usual, I’ll take the opportunity to thank my readers, be they dedicated or accidental. If you are a regular or occasional reader who has yet to comment but has not ruled out the possibility, feel free to say hello and introduce yourself below, pseudonymously or otherwise. If you would prefer to continue lurking mysteriously, that’s fine too. It’s not as if I can do anything about it. Or if there is some suitable subject any of my readers would like Sentence first to tackle (split infinitives, anyone? ), I’ll take all requests under consideration. It’s an open floor. Much as I love Kafka, his popular quote about writing does not pertain to blogging as I understand it. Dialogue is what enlivens this place. Would Kafka have blogged? I suspect not, but if he had, it would have been quite something. Worth a link, at least.